Is it worth it to post startup videos outside YouTube? I’ve been uploading my startup videos to YouTube , Vimeo, DailyMotion and Blip.tv with the help of OneLoad (the best tool I know to upload to multiple video hosting sites at the same time.) I love OneLoad as a tool and recommend it wholeheartedly to everybody that wants to upload to multiple sites: you just upload and write the description information once and you get aggregate and per channel play statistics. But I do ask myself a question: is it worth it to publish my startup videos anywhere else than YouTube? I don’t have a clear answer, but I hope that you can help me with your comments. The numbers may not be high enough to offer a definitive statistical answer (I wish I had a lot more viewers and comments!) and there’s been problems along the way that have stopped some videos from displaying in some channels. I will explain one by one. I also get some weird things like a copyright claim for a song that I cannot contest in a video without music. Vimeo scores a 10%. I pay for the pro account so that I can upload via OneLoad. The views are concentrated in a few videos that I used for my blogposts because at the time they were too long for YouTube. I love their interface and that they make me pay (yes, it gives me confidence in the sustainability of their platform). The main problem I think is related to the audience of Vimeo, that is much more visualy inclined. I don’t do spectacularly good looking videos with great music: I concentrate on the words of the entrepreneurs. Some of the videos, like the coworking dance by Spandy Andy, were not accepted due to some issue with the song. 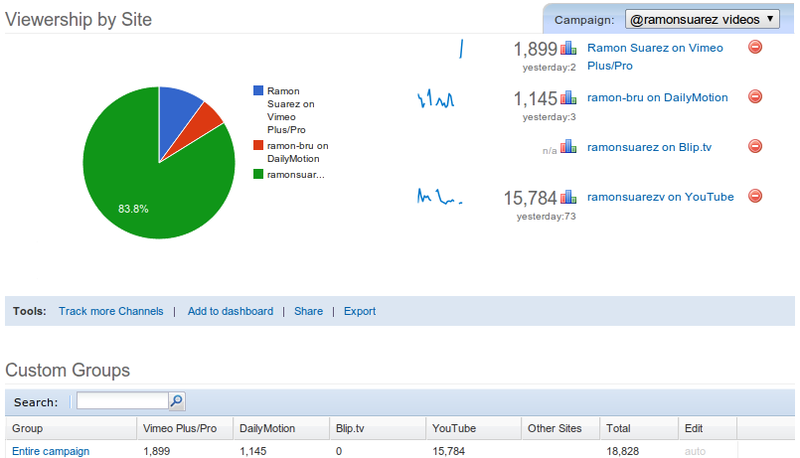 The startup videos on DailyMotion account for a 6% of the total views. I’ve had lots of issues here because of the lenght of videos, although lately it looks like everything is going through (maybe thanks to all the original content that I’m posting under a creative commons license. I guess that the problem here is also that the audience is more French-speaking and very few of my videos are in French. Also, the videos may be too serious for them. The dancing video was rejected here too, which ends up giving an advantage to youtube with their deal with copyright owners to monetize on the adds displayed on the videos they claim have some of their content. And then comes the dessert of Blip.tv: no views in OneLoad (maybe they just don’t share that info) and 650 according to their own statistics (a 3%), not even a homepage that displays right, confusing interface and login… I opened it because a TV producer that did a show at my coworking space in Brussels told the me a fatal “how can you not be in Blip.tv!“, and since he was a professional… It is the one that really is not giving me any satisfaction. I don’t even like looking at it. I’m also giving a try to business.me, a dedicated platform for business videos where I’m not uploading anything: I just add my YouTube videos to a directory that I hope will do a better matching between video and audience. They are in Beta and just starting, so the results are not very good (almost inexistent), but at least they have a lot of interesting startup videos to share the space with and I hope that in the future, if their brand grows, there will be more views and exchanges. I understand that startup & business videos may not be as interesting as cute cats and hot women, but still I think there’s a lot of room to grow and that the content is interesting enough to reach a bigger audience. Back to the question: is it worth it? The uploading of videos that fail to be available in one or the other channel makes it worth it just to have a video online that you can embedd, even if it is not in your preferred channel. The disadvantage is that there are no uploaders for my smartphone, although I use it in few cases and it is a pain to write long texts in it. Everything is set up right now, so I will just leave it as it is and see what happens in the future. But if I was to start from zero again I would just concentrate on YouTube and work more on the community management there. What do you or would you do? UPDATE (17 April): I just noticed something in the video stats that definitely tilts the balance to yes it is worth it. This video where GA Hanin explains how he found his technical cofounder thanks to coworking in DailyMotion got over 2700 views in one day. I guess that means that it was featured because I did not do anything to promote that channel. This has brought DailyMotion far ahead of Vimeo in views, but still far from Youtube. BTW: it took Posteros 8h to publish this post after sending the email and could not post via web. I wonder if the Twitter buy is already working against us.